Laudes Regiae was sung in the Norman Abbey of Fécamp when royalty entered for worship. A manuscript was brought by Osmund to Old Sarum which was discovered on the flyleaf of an eleventh-century manuscript in Salisbury Cathedral Library. 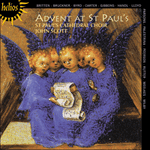 The version sung here is based on a modern edition and some of the text has been adapted for use in Advent. The music, edited by Christopher Dearnley, was written before the Norman Conquest and provides a dramatic and declamatory opening to this recording. honor illaesus, vita et victoria. Murus noster inexpugnabilis, lux, via, et vita nostra. exspectatio gentium et salvator earum. King of kings. Our king. Our hope. Our glory. unbroken honour, life and victory. Our impenetrable wall, light, path and our life. the expectation of the peoples and their saviour. through unending ages of ages. Amen. who are redeemed by the blood of Christ! May the kingdom of Christ come!